Ever since Ghost Hunters ushered in the era of reality-TV paranormal investigative shows in 2004, the genre has been booming. Every network seems to have aired its own ghost hunting show, and a formula of nightvision shots, gadgets and jargon has emerged. It is no surprise, then, that the popularity (and formula) of these shows is being pushed into a new direction - away from reality TV and into scripted fare, specifically horror. 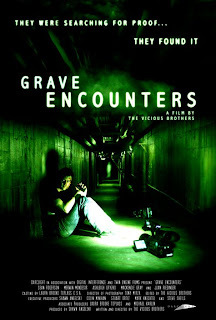 Premiering Friday, April 22, at the Tribeca Film Festival, Grave Encounters, directed by "The Vicious Brothers" is such a film. When the crew of a ghost hunting show, led by Lance Preston (Sean Rogerson) is locked down with its small team in the abandoned Collingwood psychiatric hospital, they're filming one another as they seek proof of hauntings from the institution's dark past. But when the team begins to encounter activity, they learn too late that the building itself is alive and isn't ready to let the investigators go. Grave Encounters is not the first film to use ghost hunting shows as a basis for scares (Ghosts Don't Exist is another). However, the "found footage" indie movie is the first to accurately capture the aesthetic and feel of investigative shows, which is what makes the film so intriguing. The opening sequence of the reality show, along with the "walk through tour" and eyewitnesses, is so spot-on it looks like the newest program on a cable network. The characters use much of the same equipment and expressions as televised investigators, and the behind-the-scenes segments speak to the "reality" many suspect behind reality-TV. And Rogerson, whose character is a composite of Zak Bagans and Ryan Buell, does such a masterful job as an obsessively inquisitive, fearless lead investigator that he could have a future on a ghost show if acting doesn't work out. The scares in Grave Encounters build slowly - a closing door here, an opening window there - before all hell breaks loose. The visual effects are truly indie and pretty low budget, and while rough at times, they aren't bad - but also not always the most original. The ghouls with dark eyes and twisted faces are a little too reminiscent of J-horror. Still, there are enough jump moments in the movie to show the directors are doing a few things right. Plus, the visuals are outdone by some solid sound effects, which is a key component with much thumping, scraping and echoing screams. Overall the acting, which shows Preston's team transform from cynical hipsters looking for a break to victimized true believers, features lots of shouting and swearing - but it's actually a pretty believable reaction for anyone who realizes the stuff of their nightmares may be real. Unfortunately, the last act of the film suffers from the same problem many horror flicks face, which is pulling everything together for a satisfying, logical kicker. Still, Grave Encounters works best when it's striving more for creepy than scary, and it has creepy in spades. In fact, for a building that is meant to be alive, ala The Shining, the Vicious Brothers lucked onto a brilliant location with the Riverview psychiatric hospital in Vancouver, British Columbia. On grounds shared with a still-active hospital, the old asylum is now used for filming but was once part of a cruel "lock them up, throw away the key" system of mental healthcare. Morbid though it may be, the anguish of those days is nearly palpable and frankly looks great (read: eerie as hell) as in the movie's fictional Collingwood. For a found footage horror flick, Grave Encounters is a decent offering from first-time feature film directors the Vicious Brothers. But for a film that expertly reflects and the current pop culture fascination with paranormal reality TV, Grave Encounters is a win.